by Andrew R. ~ November 19th, 2010. After your opponent takes their prize, you get to attach 2 basic energy cards from your discard pile to Regigigas and remove 8 damage counters. DANG. He is a tank. Okay now lets start fitting some pieces together. 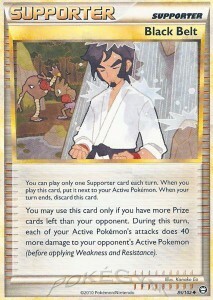 After you sacrifice your opponent takes a prize, well if you can manipulate the prize count just right and sacrifice a Pokemon when prizes are even, you are now down a prize. This now enables you to use Twins and Black Belt. Your are now doing 90 damage to anything on the field if you are belted (and you get to count weakness)! 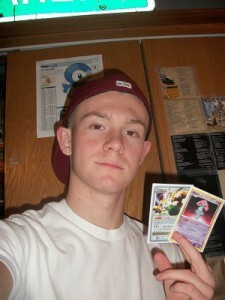 Now you are thinking, “Well if I’m going to be sacrificing Pokemon, I might as well let it be to my benefit.” And it is. The answer is Mesprit (LA 34/146). 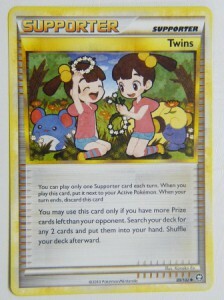 The reason it is a great card is because of its pokepower. 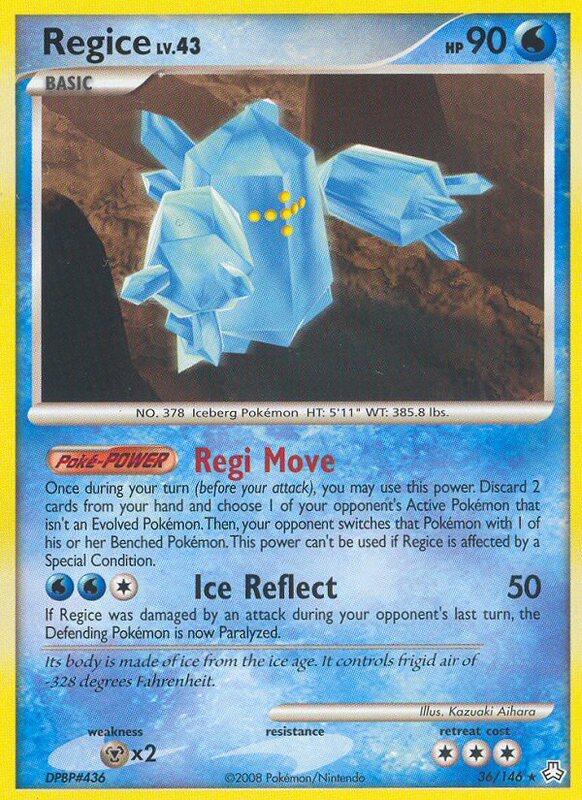 When you lay Mesprit down from your hand onto your bench your opponent can’t use ANY poke powers next turn. Although this can be sprayed, I run 3 and 85% of the time i end up starting with it. But then you ask, “Well after I Psychic Bind once with that Mesprit, he is useless?” No that’s why you run Pokemon Rescue, Super Scoop Up and Seeker, another new card from triumphant. Pokemon Rescue lets you put one pokemon from your discard pile into your hand. 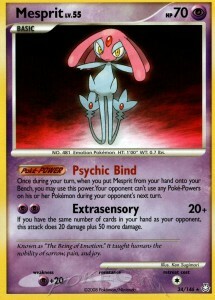 Sacrifice Mesprit, Rescue him out, ” Psychic Bind”. Being able to “Psychic Bind” for about 5 or 6 turns is amazingly good and will help you win the game. It is definitely possible to bind all through a game, I have actually done it multiple games. 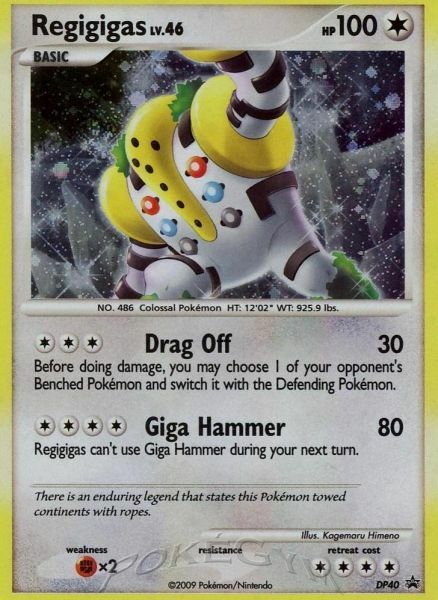 Now for the other break down of Regigigas X’s Poke Power. The energy attachment from the discard pile. You can take up to 2 basic energy cards and attach them. There are a few different ways of doing this. 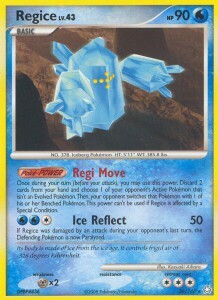 1. is Regice (LA 36/146). 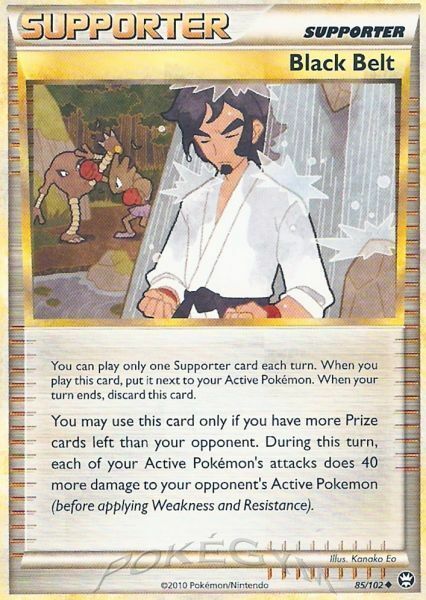 His Poke Power lets you discard 2 cards from your hand, and when you do this, if your opponents active is a basic, they must switch with a benched. Man this is great. Discard 2 energys, move the basic, and I get to sacrafice a Mesprit. Removing 8, attaching 2 cards i just discarded. Plus if you have Rescue in hand, get to bind once again. Do you see where i am going with this. Once you get this set up, there is no turning back, my friend. Just be careful and not to sacrifice unless it’s really needed. Next, I will be talking about possible techs. Though there is really not that many for this deck, we should always keep our eyes peeled. The first is Crobat G. Crobat is almost a tech for anything nowadays. The second would have to be Abomasnow from LA. Snow Play (CC) does 20 to everything. Well you go play in the snow and then come up with Gigas. You can drag off any Pixie and its already done 20 to everything else. Another tech with be Chatot G SV. Using its poke power disrupting spy lets you look at the top 4 cards of your opponent’s deck and put them back in any order. The main reason this is a tech would be to combo with Regigigas X’s main attack, Giga Blaster 100 (WFMC). The effect of the attack discards the top card of your opponent’s deck and one randomly from their hand. 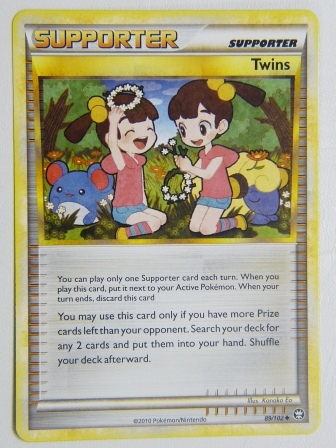 Well, say you go spying on the 4 cards and put something fancy back that they need, then Giga Blaster and buh-bye. Another tech would be the lock tech. Giratina PL (Let Loose) and Cyrus Initiative. When you play Giratina from your hand, you and your opponent shuffle your hands into your decks and draw 4. This will slow anyone down, and if you have the luck of Letting Loose then drawing into a Initiative and getting double heads, your opponent has 3 cards to work from when they draw. Plus, if you Binded the turn you Let Loose, they have no powers to work from, either. Below is the current deck list of Gigas I am running. I hope everyone enjoyed reading my first article on Team Omar. I hope it is not my last! Thank you very much.